April showers are in full effect and I don’t doubt that I’m not the only one slightly over it already? February teased us with some warm weather, but we’ve certainly been put back in our places real quick! I’ve chosen to see the bright side of this as I’ve now been lead back into my wardrobe so I can slay in my sassiest coats and jackets. This green jacket literally had me feeling like a FAUX-KING Queen so my “Royalty” slogan t-shirt accompanied by a crown felt necessary. 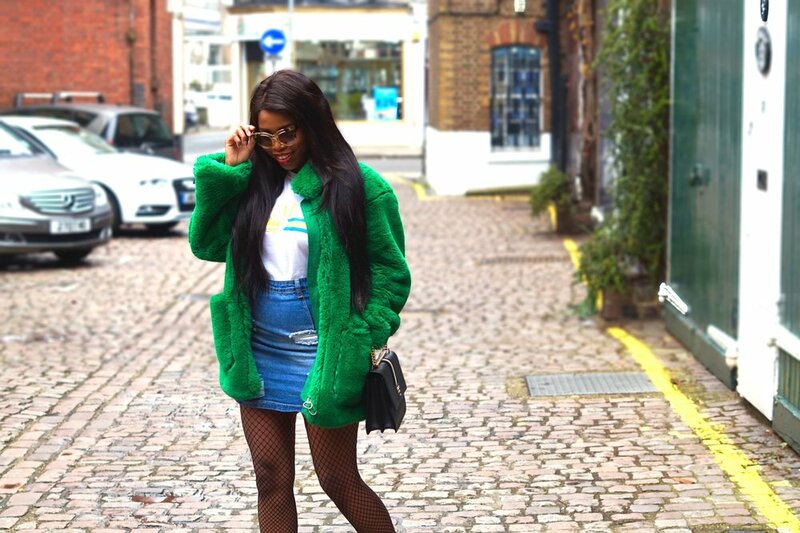 I got this green gem from Topshop, however it’s unfortunately out of stock and it doesn’t look like they’ll be re-stocking it. Sorry guys! 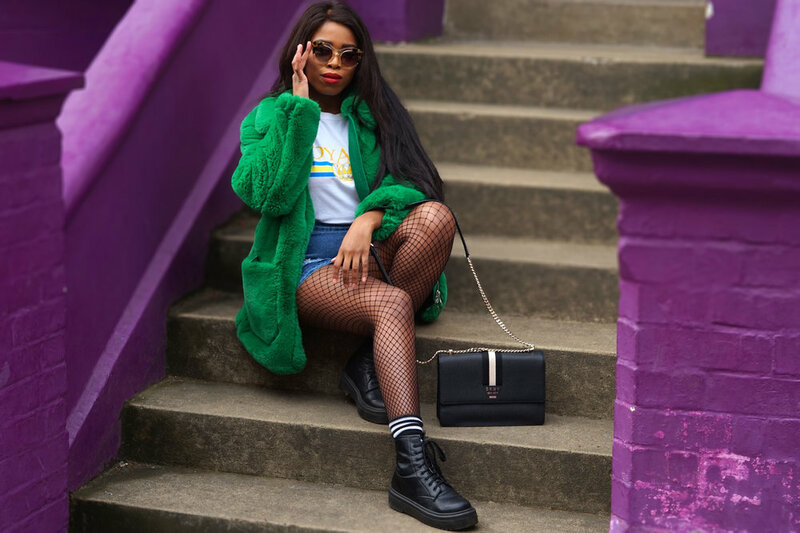 Nevertheless, Topshop have an insane range of coats and jackets that are just as extra and sassy for those of you on the hunt for a for some pop to your wardrobe. Click here to check out their products. The rest of my outfit details are listed at the bottom with the links included. Get shopping and treat yo self. Faux-k yeah! El Dorado Festival where do I even begin? Three years running, three times better than ever and three days of sassy festival fun. Let's just start with the fact that the weather was on point! Not a cloud in sight and the sun was shining over the beautiful site set in Herefordshire's Eastnor Castle. Of course your girl was glamping with Hotel Bell Tent who never fails to impress with their super cute luxury bell tents. This season I made it my mission to ensure my festival outfits were to be even bigger and EXTRA AF. 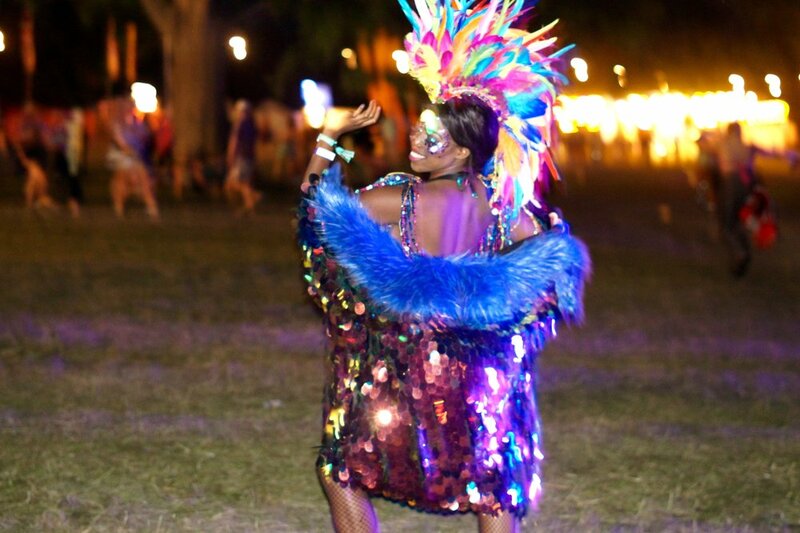 I was lucky enough to work with three of my favourite festival/carnival themed brands Feathers & Thread, RML Designs and Seadragon Studio. The dress up themes for this year was their traditional 'Gold treasures' and 'Disco Kings & Queens.' So obviously as the festival Queen I had to come through and serve some sassy festival goodness for you all. Let's start with these INSANE feather headdresses! Every Queen needs a crown right? The talented Anna Turton of Feathers & Thread cooked up some serious magic with these headdresses. The Gold feather sequin headdress is carefully handmade with peacock feathers and finished of with gold sequin detail. Feathers & Thread's new collection consists of their carefully constructed luxurious feather mowhawks that are undeniably designed to SLAY & stand out from the crowd. Also designed by Feathers & Thread are the epaulette shoulder pieces which were the perfect addition to my Saturday & Sunday themed outfits. I had a vision, we discussed ideas and they were executed above and beyond my wildest expectations! Shop the Feathers & Thread store here and be amazed. 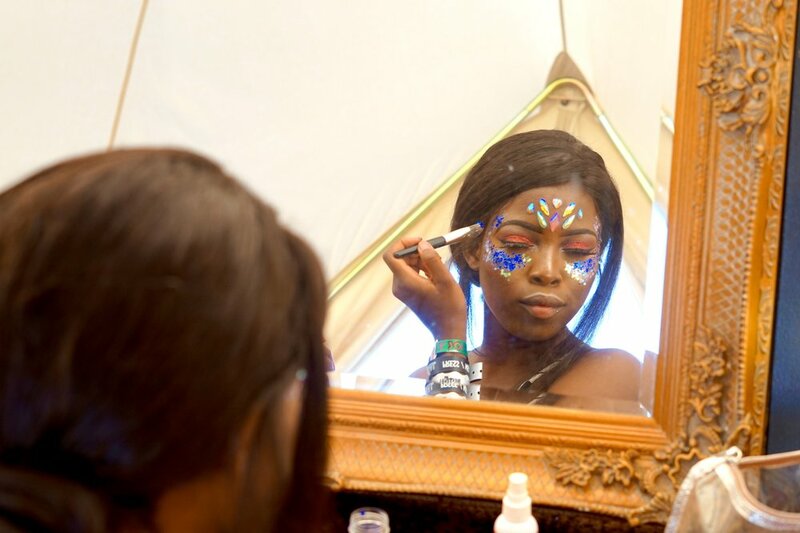 If you're after the ultimate festival bra or accessories then you definitely need to check out RML Designs. San Diego based designer Marisa Nicole created my stunning festival bra's and fluffy purple sergeant hat. All of her designs are also handmade with the most exquisite detail. The fluffy sergeant hat pictured was finished off with LED lights. Marisa has also introduced a brand new collection of funky sergeant hats to store (which I admittedly would love one of each), each of which can be styled in an array of outfits whatever the occasion. Shop the RML Designs Etsy store here. It's safe to say that El Dorado definitely has to be one of my favourite festivals. I've been attending since their first year and it's been fantastic having the opportunity to watch them grow. This is a music festival that has maintained it's essence of boutique uniqueness, a wonderland of fun and fantasy. This year they introduced their brand spanking new woodland stage 'The Nest.' Tucked away under the trees this new stage definitely is their hidden gem with awesome jungle vibes. Headlined by Mr Scruff the atmosphere was incredibly fun and lively. Shop Feathers & Thread here. Sister Sledge headlining the Garden Stage. Sunday's Disco Kings & Queen's theme was appropriately headlined by the iconic Sister Slegde. Their sassy performance concluded with a an amazing fireworks display. Can we please just enjoy it all over again please? I'm already looking forward to next year! Check out the official pictures on their Facebook page here. For the duration of the festival I was also a busy butterfly capturing lot's of filmed footage of my outfits and my overall El Dorado experience. Keep an eye out for my upcoming sassy El Dorado Festival after movie that will be live on my YouTube channel very soon. If you haven't already, make sure to subscribe to my channel here.